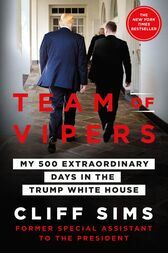 Cliff Sims was the CEO of Yellowhammer Multimedia, Alabama’s premiere source for political news, until he joined the Trump campaign in August 2016. After the election, he moved from Trump Tower to the West Wing, where he crafted the White House’s messaging. He now advises major corporations, CEOs and media personalities on a wide range of public affairs and communications issues. He lives with his wife and dog in Washington, D.C.